So I planned to knit up these slippers for my Mom and put them in the holiday gift stash, but I'm not sure I can give them away! So cute and cozy! I really like the Mission Falls wool. It's one of the best superwash wools I've worked with, and the color selection is fabulous. It's a heavy worsted, much thicker than Cascade 220. It's neither plastic-y (Swish) nor scratchy (Lamb's Pride superwash). 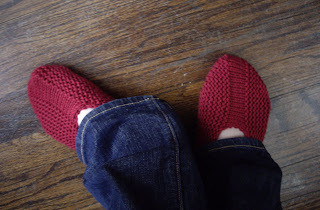 These slippers fit my big ol' size 9 feet much better than the pocketbook slippers I knit last fall. So, do I make these flowery or leave them plain? Any thoughts? In Sarah's original pattern she includes a flower that's very fiddly; she recently wrote up another flower that looks more my speed -- the Simple Knitted Rose and Leaf. 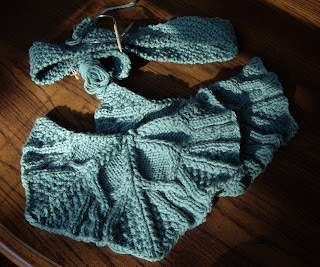 Speaking of knitting for my mom, Gust is nearly done! I'm knitting it much longer than the pattern calls for. I want Mom to be able to really wrap it around her neck. I'm still loving the yarn -- The Plucky Knitter Merino single ply merino lace. As soon as I bind off (which should be within the next day), I'm sending off the leftovers to Joline as part of brainylady Alison's laceweight leftovers swap. 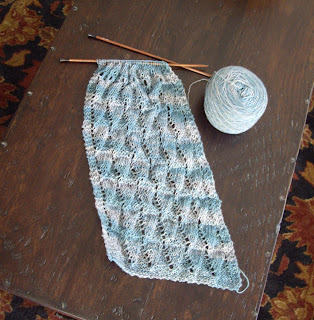 Notes: While my gauge swatch was close, I forgot to take into account how loosely I knit lace. 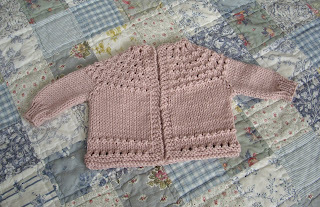 So the finished cardi is a little bit cropped. I'm hesitant to frog back the bottom and add a couple inches, but I probably should. I followed the pattern very closely this time. 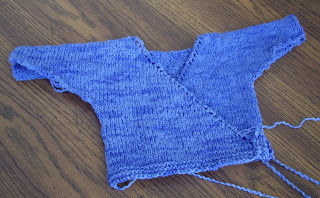 Next time I'd put the sleeves on waste yarn and knit the body, then come back and knit the sleeves in the round. EZ doesn't mention the buttonholes until you should have already made a couple. I just went with one button. The 5 (more like 9) Hour Baby Sweater now sports a white grosgrain ribbon. Have you seen this cat sweater pattern? The poor dears... they look none too thrilled, but they're so darn cute! I predict that someday, when I'm feeling very blue, such a project may be attempted. 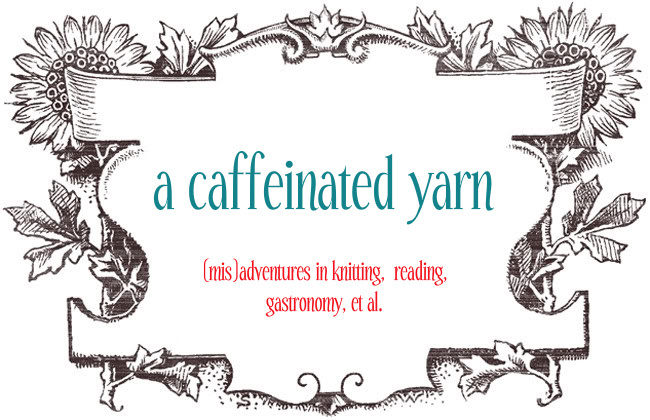 Check out the Ravelry project gallery, too. Back with actual knitting content tomorrow. Apologies to anyone who received spam from my hotmail account -- I think it's fixed, but keep me posted if anything else weird pops up. ETA: This agreement between VCU and Philip Morris is very, very sketchy. It goes against the entire ethos of the research university, especially the public research university. Last weekend I headed out with some friends to the Indiana Sand Dunes along Lake Michigan. The lake was the most beautiful shade of aqua. 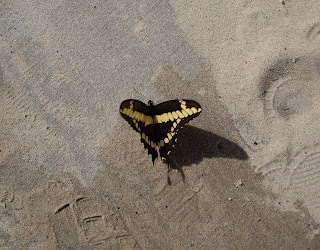 Surprisingly, I saw quite a few butterflies! This one was determined to be underfoot and nearly got stepped on. 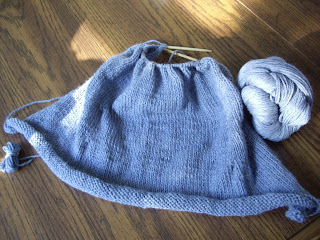 The knitting is almost done for the Brea Bag -- just a few rows left on the gusset. The finishing's going to be finicky. I had no idea purse straps were so expensive and hard to find (not to mention that most are bizarre looking)! If I had done my homework, I would have realized how pricey these were and bought enough yarn that I could knit the strap, too. Alas, it's not in the cards this time. On the flip side, I'm looking forward to picking out some cute fabric for the lining! Speaking of fabric, have you seen Amy Butler's new Birdie Sling bag pattern? Very cute! 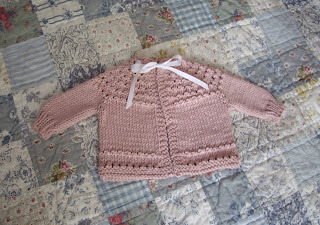 Can I knit a 5-hour baby sweater in 5 hours? The answer is no. However, it really is a quick knit (just not 5 hours). 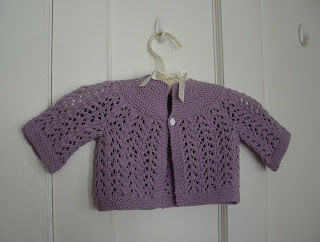 A fairly easy pattern that yields a cute, tiny sweater. The fabric is very loose and floppy at this gauge. I would use a chunky yarn if I were to knit it again. I still need to pick out a ribbon to put through the eyelets at the neckline. baby kimono, books, and movies... oh my! 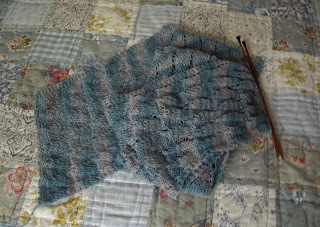 The yarn is Manos Cotton Stria, which has a texture like ricrac, albeit very soft and fluffy ricrac. It seems a bit odd for seaming, so I may use perle cotton. The color is just beautiful! The yarn's from a swap with Sonya. Thanks again, Sonya! 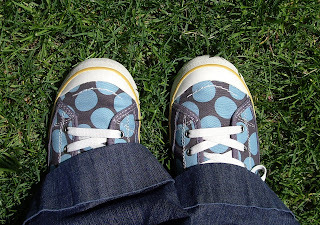 Hemp, organic cotton, recycled car tires... pretty sweet. - Death at a Funeral ~ A funeral turns to chaos as family secrets are revealed. Funny and light, and very British. - 27 Dresses ~ Bad writing, bad acting... but I didn't really expect too much from it. - The Pursuit of Love ~ Beautiful BBC miniseries adaptation of Nancy Mitford's "The Pursuit of Love" and "Love in a Cold Climate." The acting is pretty good; the only bad part is that it's fairly compressed and much is left out. I enjoyed the books, too. Thanks to everyone for your kind comments on my first design! Please do let me know if you have any problems or questions (I know a chart for the owls would be helpful). The baby owl vest pattern is now available as a Ravelry download in PDF format, too. Figuring that out was perhaps more of a challenge than the design itself! Yarn: The Plucky Knitter Merino Lace, "Dashwood"
It's a lovely pattern, but I'm getting a little tired of it already. It's destined for my mother, who ooh-ed and aah-ed over my Woodland Scarf and requested something lacy for herself. 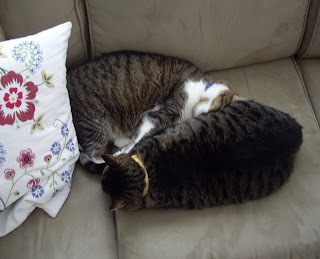 Even the cats have spring fever. 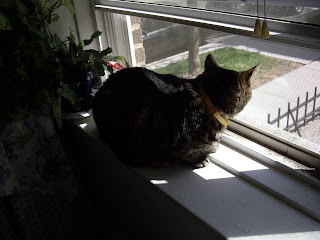 Kylie has taken up her regular warm-weather position at the open window, stalking passers-by. Sarah tagged me for the 6 Random Things meme a while back, and I'm finally getting around to it. What can I say, maybe I don't play well with others? 1. I love cars, especially classic cars. I can outlast the guys at the auto show. My dream car? 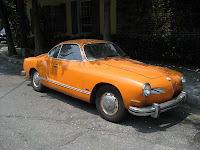 A classic VW Karmann Ghia (or maybe a Thing or an MGB 2-seater or a 1966 Mustang convertible). Sadly, I drive a tan Chevy Malibu. 2. Nothing makes me happier than a day spent outdoors in the mountains or by the lakes, with plenty of sunshine and fresh air. Sadly, I live in the heart of Chicago. 3. I was afraid of cats up until I was 10 or so. 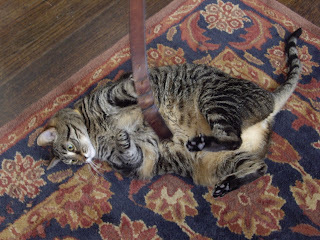 My aunt's cantankerous old tabby (with the oh-so-misleading name Tinkerbell) gave me a thorough scratching when I was little. 4. Dark-haired men, especially ones with beards or mustaches, also terrified me when I was little. I would run away screaming and crying. Apparently I'm good at conquering my fears, as Paul has dark hair and we have two cats! I'm still not big on facial hair, though. 5. I love cheese. You know how some people are wine snobs? I'm a cheese snob. I blame it on my years spent in Madison, WI. 6. I'm a very fast reader. I often devour novels in just one sitting. Nowadays I'm a little afraid to open up a book, as I know I can't stop once I get started. As soon as the quarter is over, though, I'm going to read with reckless abandon! Want to share some random things? Consider yourself tagged!